Leather Earrings There are 19 products. 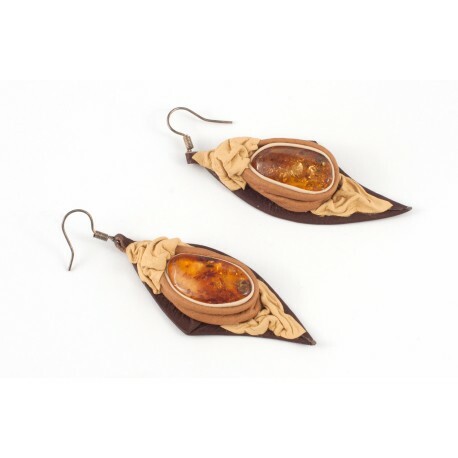 An authentic, author's hand-made leather-amber earrings. Real leather, matte and clear amber pieces with the impressive, naturally formed unique patterns. 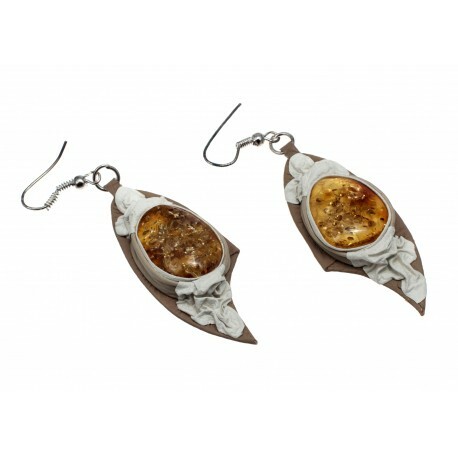 Earrings are decorated with the ornaments of shrunken leather layers, with round or asymmetric piece of amber laid in the middle. 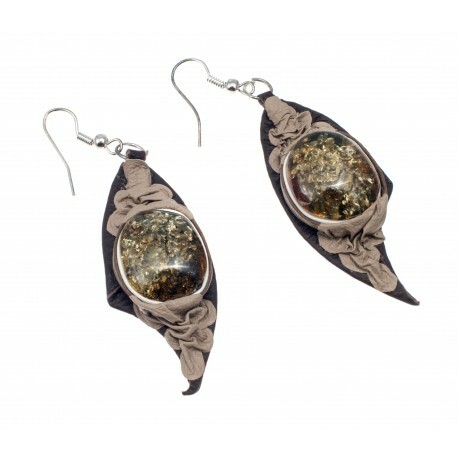 The original, black colour leather earrings with the gently polished, yellow amber in which small scales and brown ornaments are sparkling. An accurate handmade piece of work. Handmade leather earrings with yellow-colour amber. The clear amber is with the impressive, naturally formed patterns. Oval amber surrounded by a wavy skin composition reminiscent of a pine trunk fragment. It is like a droplet of droplets that will help you feel closer to nature. Sand-colour, leather earrings with the sparkling amber. 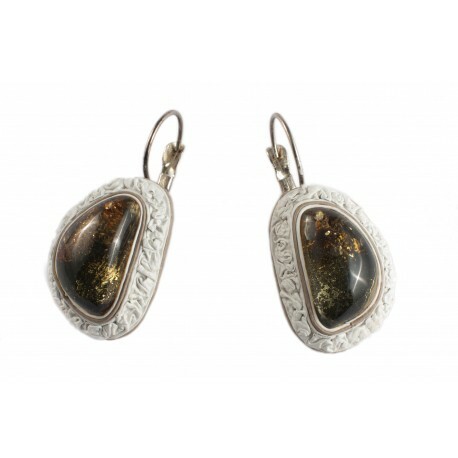 Brown, leather earrings with gently polished, clear yellow and cognac shade amber, which sparkles whenever it catches the sunlight. 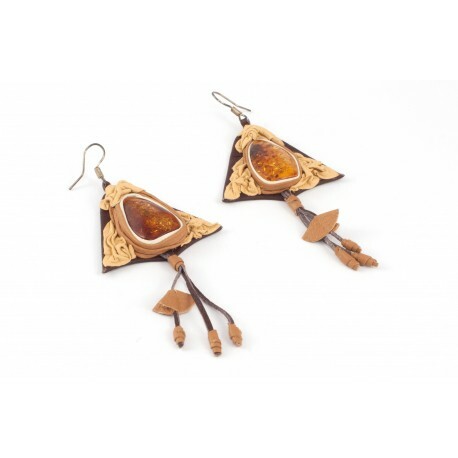 The earrings are decorated with the ornaments of brown,shrunken leather. 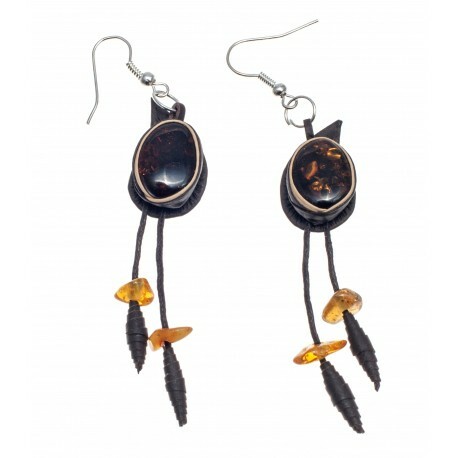 Black and brown leather earrings with clear, lemon, yellow and cognac colour amber. Tamsiai ir šviesiai rudos spalvos odiniai auskarai su glotniai nupoliruotu, iškiliu, žaliu gintaru, kuriame matomos žemės bei augalų priemaišos, tarsi miško samanų paklotė. Auskarai dekoruoti balintos kavos spalvos, rauktos odos ornamentais. Balintos kavos spalvos odos auskarai su glotniai poliruotu, skaidriu geltono bei konjakinio atspalvio gintaru, kuris sužaižaruoja kiekvienąkart pagavęs saulės šviesą. Auskarai dekoruoti baltos, rauktos odos ornamentais. White coffee colour leather earrings with gently polished, clear amber with the yellow and cognac shades.This amber shines every time it catches the sunlight. The earrings are decorated with the ornaments of the white, wrinkled leather. 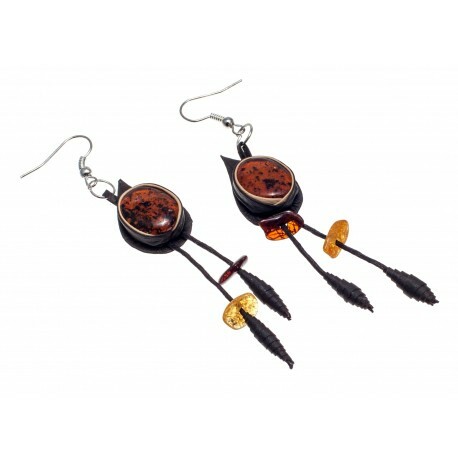 Dark brown colour leather earrings with cognac, brown colour amber in which amber scales are sparkling like the woven pattern of the forest's witches. 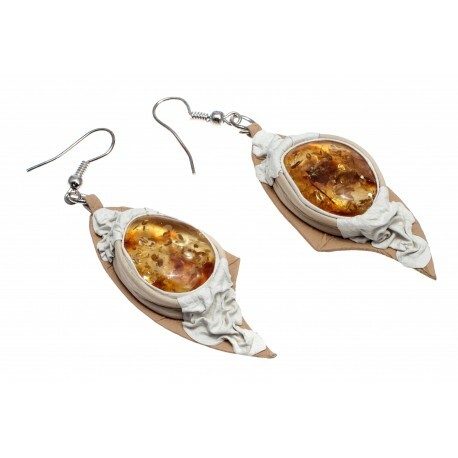 The earrings are decorated with the white coffee colour leather band and yellow amber pieces. 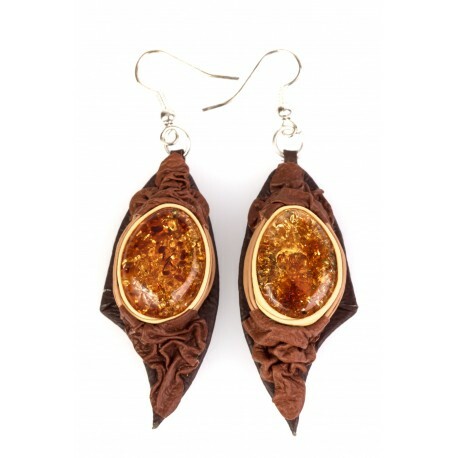 Dark brown leather earrings with the clear, cognac-color amber in which soil and plants' impurities can be seen. The earrings are decorated with the leather band of the white coffee color.These original earrings shines with the harmony and you want not only to look at them, but also to wear them. 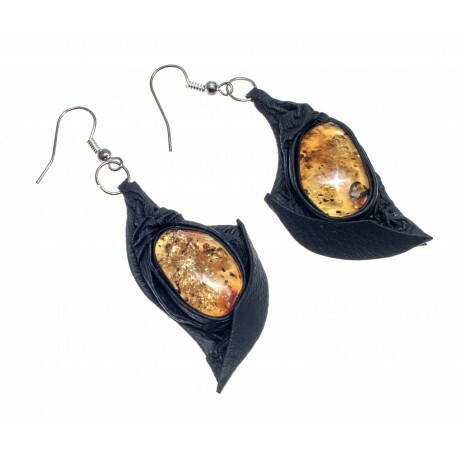 The original, black color earrings made from the wrinkled leather with gently polished, yellow amber in which small scales are sparkling. It is a nice, hand-made piece of work. 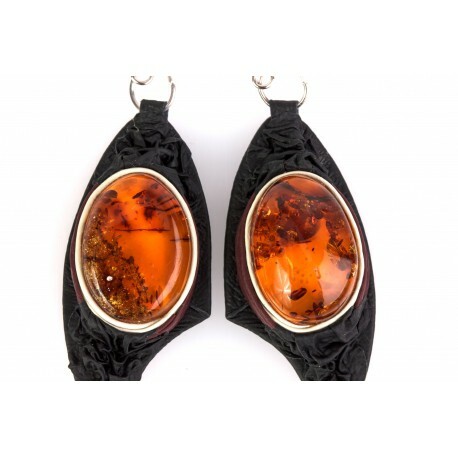 Black and cherry-color leather earrings with transparent amber. 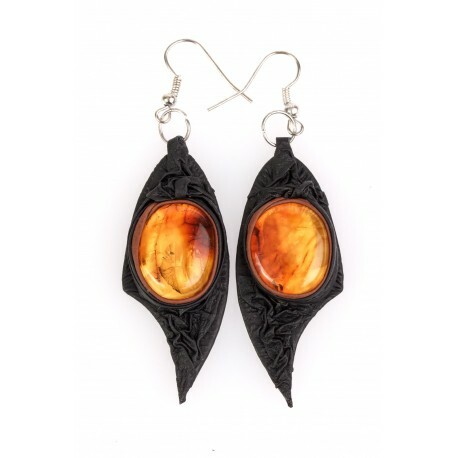 Black and light-brown leather earrings with amber. 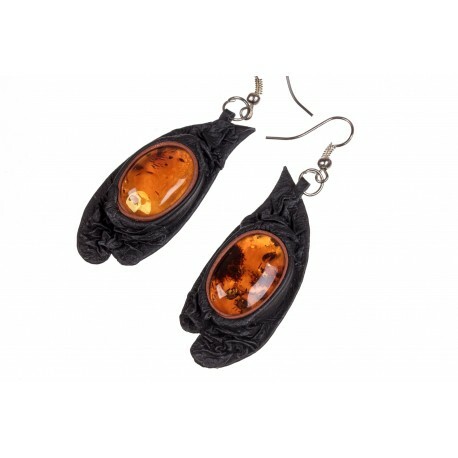 Real leather earrings with amber. 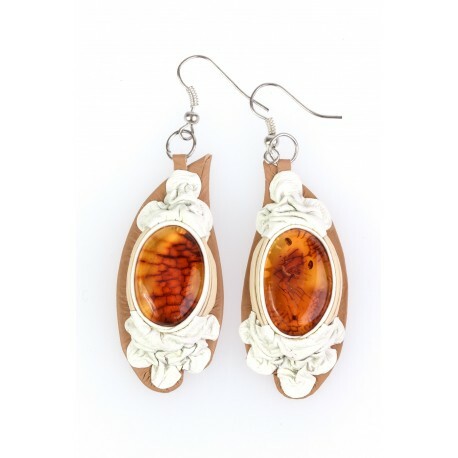 White leather earrings with amber. 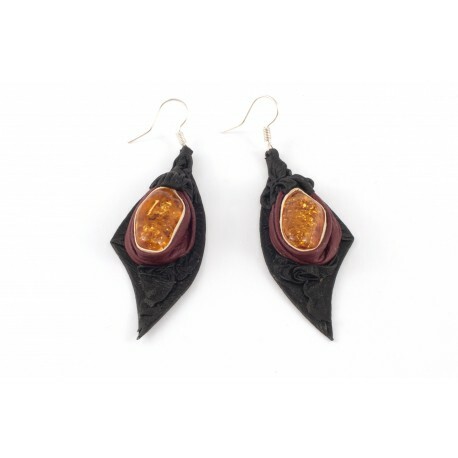 Black leather earrings with amber.